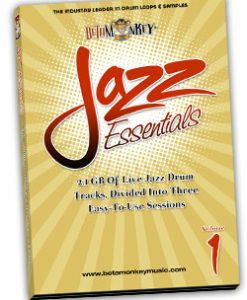 Jazz Essentials II offers a massive collection of complete live jazz drum tracks. With versatile and essential jazz drumming styles in a wide range of tempos and styles, these live jazz drum tracks offer users over 2 GB of live jazz drum tracks in three easy-to-use style-based sessions. With full-length drum tracks (not loops), Jazz Essentials II covers traditional jazz styles as well as brush work and Latin-jazz playing styles. Traditional Jazz, Latin Jazz, Blues-Jazz. An exhaustive sample library for live jazz drum tracks! This collection of jazz drum tracks offers full live takes of essential jazz drumming styles in a wide range of tempos and styles. If you’re looking for a different approach for your jazz drum samples, then the second installment of the Jazz Essentials Series is ready to inspire you and your music. You get the full takes, with 100% live jazz drum tracks lasting from 3-12 minutes in performance length. Due to the nature of this genre, we wanted to go with the live feel and not relegate great playing and phrasing to a collection of one, two, or four bar jazz loops. Each track begins with basic timekeeping and continues to build in complexity and intensity – adding complex syncopation and musical jazz phrasings. It’s easy to grab a few bars of the phrases you need or use the tracks “as is” to play along and build improvisational skills. Perfect for playing along or for grabbing just the bars you need. An absolute wealth of traditional jazz drum tracks, played with impeccable taste and time. Without question, an exhaustive resource covering a wide range of popular jazz playing styles and tempos. We let the tape roll and captured it all – all the swing you crave as well as the warmth of a maple Gretsch drumset to deliver a versatile resource of jazz and jazz-latin drumming and grooves. All tempos offer a dedicated groove section – from basic time-keeping to the “let loose” syncopations of the genre as well as a dedicated fills sections, complete with intros, pick-ups, and endings. And, to round out the disc’s versatility, we’ve included a matching set of multi-velocity drum and cymbal samples from the kit used in recording the loops. So, whether you want to play along and hone your chops comping with the full source tracks or dig out your audio editor and construct your next jazz project with loops, the rhythmic possibilities of Jazz Essentials II are limitless. It will quickly become an indispensable compositional tool in any jazz musician’s sample library. Multiple Jazz Drumming Styles: Authentic drumming performances covering traditional jazz as well as Latin jazz, 3/4 jazz, blues-jazz swing Drum performances. Performed with brushes and sticks. More than Loops: The ten (10) complete source jazz drum tracks range between 3-12 minutes long, mixed and ready for you to use to improv, comp, or trade off. Use “as is” and play along or edit the tracks into custom loops perfect for your next project. Not like the “typical” jazz sample libraries currently available. Wide Range of Tempos: 60 BPM to 200 BPM tracks give users a full range of tempos, with tracks presented in 15 BPM increments. Superior Rhythmic Realism: No one, two, or four bar repeated loops here! Full tracks convey the authentic phrasing, feel, and sound that is uniquely jazz. Get drum performances with total jazz feel and expression. High-End Production: High-End Production: Recorded in a World-Class Recording Studio, the in-house studio for a well-known jazz record label and performance space. Cohesive Groove Sets: All tracks were recorded in a single recording session, using the same in-house Gretsch Maple drum kit. One mix, one kit, one room. Consistency is the key here. Fully-Sampled Drum and Cymbal Samples: A complete set of multi-velocity samples of all the drums and cymbals recorded. Build more grooves from scratch or use them to augment the drum tracks to fit your music. 2.07 GB original, license-free 24/44 WAV or AIFF drum tracks. 16/44 WAV version is aprox. 1.5 GB. 94 (102 MB) multi-velocity drum and cymbal samples (available as instant download with 24 Bit purchase). Available in 24/44 WAV and AIFF audio loop formats. Note: All jazz tracks noted as “Groove Tracks” include basic time-keeping, multiple grooves and variations, and fills. “Fills Only” tracks are exclusively fills – intros, pick-ups, trading licks, and endings. See below for audio samples. 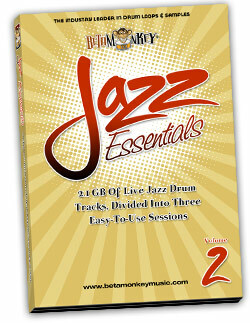 Jazz Essentials IV delivers 3.2 GB of live jazz drum tracks, ready to import into any DAW. These multi-track drum tracks offers multiple takes with sticks and brushes and interpretations of the several jazz standards. With a seasoned New York jazz drummer behind a well-traveled set of maple Gretsch drums, this downloadable collection of jazz drum tracks offers fifteen drum performances of many popular jazz standards song forms. 400+ jazz drum loops featuring authentic jazz phrasing from a laid-back 100 bpm to blistering 325 bpm. This jazz loop collection is all about traditional jazz, focused on of essential timekeeping grooves for discriminating jazz musicians everywhere. It don't mean a thing if it ain't got that swing! For anyone writing Traditional Jazz, Bebop, or Swing, these are the jazz drum loops for you. Pure. Live. Traditional Jazz. Multi-track Drums for Jazz Standards. 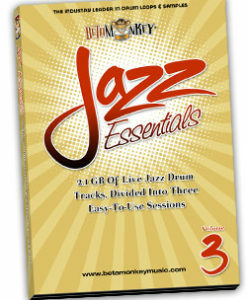 Jazz Essentials III delivers 3.3 GB of live jazz drum tracks, performed as three common jazz song forms. Each song form offers multiple takes with sticks and brushes, providing different interpretations of the music. Jazz Essentials III offers seven discrete, individual drum tracks: kick, sub kick, snare, overhead left, overhead right, hihat, room ribbon.